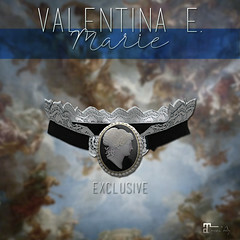 October 2017 – Valentina E.
NEW! Valentina E. Matilda Ensemble @ UBER! 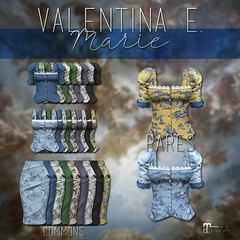 Out now at UBER the new Valentina E. Matilda Ensemble! This stylish wool belted coat features optional dickie or mock sweater. Available in four colors exclusively for Maitreya Lara at this special event. NEW! Valentina E. Eve Gacha! Out now at The Epiphany the new Valentina E. Eve Gacha! Play for long or short versions of our kimono inspired dress for just 75 L a play. Don’t miss our Exclusive item, our Eve Wearable Snake! NEW! Valentina E. Vale Puffer Jacket @ Chapter Four! Don’t miss our new Valentina E. Vale Puffer Jacket Gacha only at The Chapter Four! Play for 3 rares and 14 commons for just 50 L a play. This item is exclusively for Maitreya Lara. Please try a demo before purchasing. We hope you like it! NEW! Valentina E. Friday Dress @ Salem! Don’t miss our brand new Valentina E. Friday Dress at Salem, now open! This stylish dress features jeweled button detailing, puffed sleeves and a vintage inspired neck bow tie. Available in four colors exclusively for Maitreya Lara. Don’t miss it! NEW! Valentina E. Mademoiselle Tux Dress @ FaMESHed! Out now at FaMESHed the new Valentina E. Mademoiselle Tux Dress with optional loose bow tie! Available in four color options exclusively for Maitreya Lara. Don’t miss it!